Who can believe that it already November? The leaves have fallen, we’ve already had two snowfalls (in Omaha, NE! ), and the sounds of Christmas have already begun. I too have had a crazy, busy year, and actually, starting today, I have a new project that is about to begin which will be due come January – in addition to all of the family obligations of daily life, gift buying and giving, Thanksgiving dinners, birthday parties, and finally Christmas celebrations. Who has time for anything else!? I’ve honestly wanted to write more Catholic Upgrades, but time again has slipped away along with the summer heat. But just looking at the cover of this book, Rejoice! Advent Meditations with Mary by Fr. Mark Toups brings me such peace. The images are so simple and so beautiful. A new mother, cherishing her new child, holding him close while her husband holds them both. There is such tranquility in this image: peace, love and joy. This is a daily journal meant to slow us down and really ponder what is happening just as Mary pondered in her heart all that was happening to her. While the journal is meant to be used as a journey with others in a parish or small group settings, just as Mary and Joseph would have journeyed with others to Bethlehem, we can also use this for private revelation to take the time to reflect in our homes or wherever God speaks to us. Like the cover image that draws us into the journal, Ascension has also given us other tools to keep in the spirit of Advent. First, you can go to Ascension Press and download the cell phone backgrounds. Each week, you can change your background on the device that has almost become a requirement to living life in the 21st Century, and turn it into a constant prayer tool to refocus your daily life upon what really is most important in our lives – Christ. Also, if you’ve fallen in love with the prints as much as I have, you could even order museum-quality prints which can be framed and displayed to remind us of our journey through Advent. (They are only going to be available through the end of 2018!!!). Along with the images, there are also videos. You can sign up for a link to each of the weekly videos which will help guide the reflections. Each of the videos are only a couple of minutes, but they help guide what to focus upon for the week. The only way to find places in our daily lives where we need to slow down, is by actually slowing down and thinking about what we can “stop”. We must look towards the quietness of the Nativity. And I haven’t even cracked open the book yet! Turning to the first day of the first week, we see location of the week, each week moving closer to the birthplace of our Lord. The image to ponder for the week also covers the second page. Be sure to take a few minutes before starting each day to place yourself in the image. For example, where would you put yourself in this image of Gabriel giving Mary the Good News of Jesus. Would you be standing next to Mary? Or maybe kneeling? What does Gabriel look like? What do you smell, feel? Is the room warm or cool? There is so much to pull out of just an image and our own imagination. Each day has a focus word, and a Bible passage. I suggest stopping here and just really reading this passage. 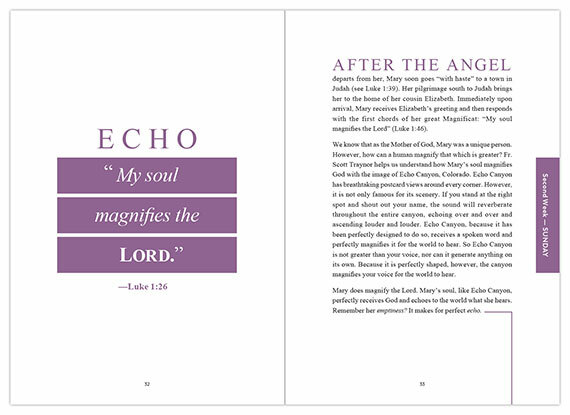 “My soul magnifies the LORD” – My soul! It’s me, and what I do that magnifies the LORD. What do I do to magnify the LORD to others? What do I do that doesn’t? There is a short history and reading on what was going on before Jesus’ birth, and how it still ties into our present daily life. I know the daily life during Jesus’ time wasn’t quiet nor peaceful, and it probably was just as busy. But when we look at it through the eyes of Mary, we can see how to really live the life that God has called us to live. Finally, there is a “For your prayer” section which takes a Psalm to ponder like Mary would have and plenty of space to write for your journaling. Write as little or much as the Spirit guides you. This is where we can really reflect upon your life and what is really important to us and our families. Christmas gifts are fun, and there is great joy in seeing family we haven’t seen all year, but without Christ, there would be none of this. It is because of Him that we even come together and celebrate. Just writing this review has already changed my attitude towards the upcoming holiday season. While I was getting more and more stressed – already feeling behind – I am now refocused upon what is really important during Advent. It is more important that I prepare my heart and the hearts of my family for the one who is coming, Jesus. I have a new calm and peace, that only comes through God. And I want to share that with others, so that hopefully they too can prepare a room for Jesus in their hearts too. 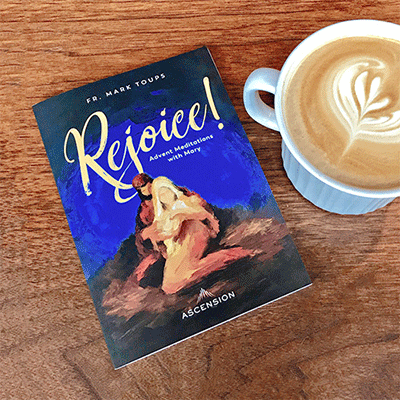 You can purchase a copy of Rejoice! 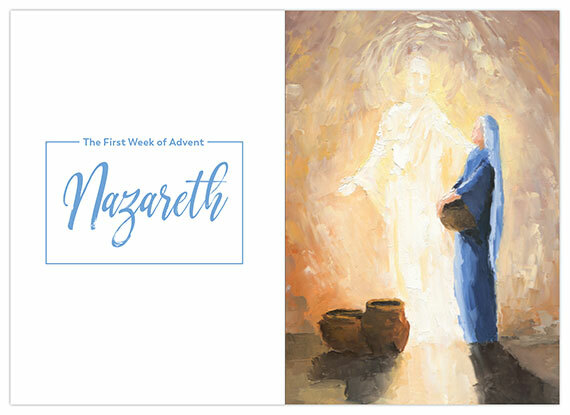 Advent Meditations with Mary by Fr. Mark Toups, either on Amazon or Ascension Press, where you can also sign up to receive the weekly videos, download the images and you can even purchase the prints before the end of the season. May God bless you greatly throughout the season of Advent and help you to prepare a room for Jesus in your heart. You don't change your life for an idea. You change your life for a person. This Advent, don't get caught up in the busyness. Don t get lost in the anxiety of preparing for a day. Joyfully anticipate the coming of the person of Jesus through an encounter with his Most Blessed Mother. Imagine having an Advent that is more peaceful, more joyful, and more meaningful than ever before. The Rejoice! 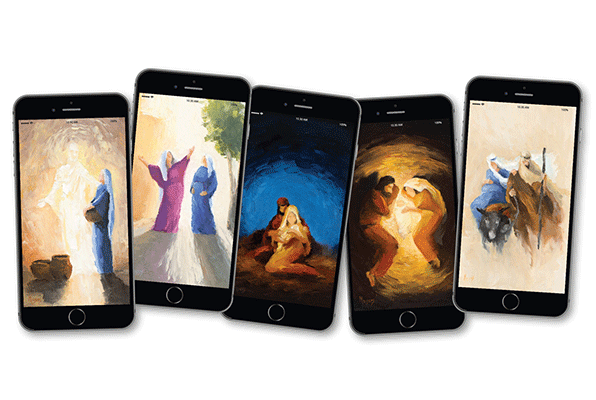 Advent Meditations with Mary, Journal not only lets you walk beside Mary during the first Advent, but also lets you get to know her in a way you haven t before. Rejoice! offers more than insights and information about Mary's life it offers an opportunity for you to encounter Mary in the quiet of your heart. ● A word - Focus on a single word each day to draw out the details, the specifics of who Our Lady is. ● A reflection - Learn more about Mary, the culture in which she was raised, and the world in which she lived. ● A Psalm - Each day, you're given a Psalm to pray (just as Mary herself would have prayed) to help you enter into prayer. ● A reading - In reading Scripture, you find the Word of God, bringing you closer to Mary, who carried the Word in her body. 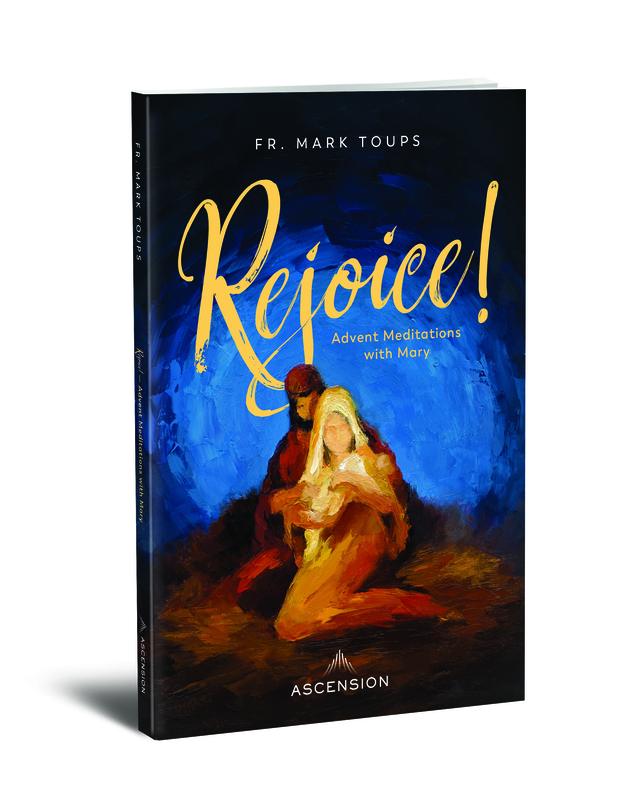 Advent, Book Review, Catholic Upgrade, Mary. Bookmark.